Bernos stands for quality. Bernos stands for cultural pride. But what is Bernos? Bernos is becoming a cultural phenomenon in the Washington DC area. Their shirts have been seen on K’naan, featured on several local news outlets, and are poised to make a difference in a big way in the region. Their fans have been growing and their t-shirts can be spotted on any given day in the DC area. What made them such a phenomenon? Jamati.com caught up with them to find out. Jamati: Bernos has come a long way from its humble beginnings. How did you all, as founding members come up with the idea to make t-shirts? That’s a good question. The idea behind making Bernos t-shirts is simply organic. We were all looking for a way to express ourselves creatively and felt it would be a great avenue to do something that came naturally. Being lovers of t-shirts, and it being the main source of our fashion statement, we wanted to design t-shirts that expressed our historical and cultural landmark. Each one of us plays a respective role in the daily operations of the organization. Together we each bring our individual skills in the areas of business, fashion, graphic design, and photography. With all our talents combined it was inevitable that our brain child Bernos was born. Published by DawitK April 6th, 2009	in Bernos and Shameless Plug. Congratulation to all of your successbernos. Hard works do pays off at the end and I’m glad to see that u guys are getting recognised for it. Keep up the good/positive movement! When is your next design coming out? I am So happy for u as ur fan. that is my sister’s favorite you have on. Don’t wanna be off topic but the guy on the left u seriously got to do something with the hair either cut it or if u got long hair take care of it. I have the same key chain cool u do 2. Good work! I dig the blogging – but I must confess, I want to see MORE SHIRTS!!! In fact, I’ll even give you an idea – just cuz’ I’m that type of dude. Ready? A basic scan of an old Ethiopian Shekla – that hasn’t been reissued, of course. 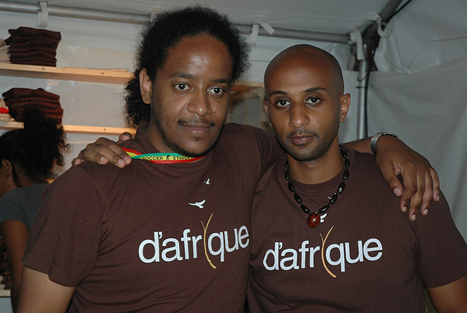 For example, there is a Mulatu Astatke shekla from back in the days on Addis Ababa Records – that would be v. cool!!! Or there is another one – pressed in Japan many years ago – where the text is all in Amharic! I wculd buy a whole bunch of those!!!!! I’m sure EthioJazz could get you the scans. Keep it up!!!!! soooo excited I can’t wait! Yooooo! check it out bernos!! U just made our day…thanks! Nice!!! Congratulations again and again! will i ll came to you one day .if god give to . mestika, good thinking. well, i’d like to be a shareholder. how about it guys? Hello, everything is going sound here and ofcourse every one is sharing data, that’s in fact excellent, keep up writing.